Apple today announced that its iWork suite of apps for iOS will be updated next week with enhanced Apple Pencil integration. Keynote, for example, will gain new animation options that let users draw an animation path for any object, and an all-new user interface for implementing build effects such as move, rotate, and scale. iWork apps for iPhone and iPad include Pages, Numbers, and Keynote. All three apps are available for free on the App Store. 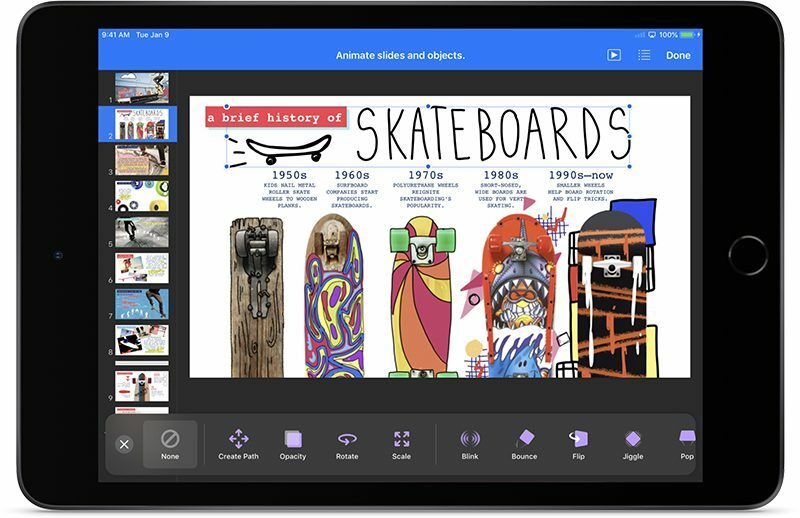 Other new features will include the ability to create and share animated GIFs by exporting one or more slides in Keynote on iOS and macOS, add vertical text in Chinese, Japanese, and Korean languages to the body of Pages documents on iOS, increase max zoom to 400 percent in Numbers on iOS, and more. Improvements to collaboration: edit grouped objects while collaborating. Maximum file size has increased to 2GB. Save and sync shapes, templates, and themes: save custom shapes, templates, and themes on iOS. These will sync across macOS and iOS devices using iCloud. Image placeholders: create image placeholders to replace images without affecting the formatting of your page, slide, or spreadsheet. The news was shared alongside the launch of new iPad mini and iPad Air models today. As a fan and heavy user of iWork (on macOS and iOS) I look forward to any updates. Now please, please add back full support for linked text boxes as they worked in iWork '09. I love iWork. Use it against the enterprise norms and it’s still worth the workarounds and scolding from colleagues. Totally serious question... What's the use-case here? Why would I want to go from page 3 to page 1? Some kind of funky, foldable brochure? Exactly...brochures, bulletins, and newsletters. (though that use case describes PocketMods which IS funky and foldable). A simple booklet using Letter (or A4) page in landscape folded in half (horizontally). To get things to flow easily, I set up block#1 on the right side of page 1, block#2 on the left size of page 2, block#3 on the right size of page 2, and block#4 on the left side of page 1. I also have some extensive books (40+ pages) for seminars using that technique. The text boxes are linked in a double-helix format so that the half-pages get displayed in correct order when printed, folded, and stapled. I have both iWork 09 and the latest version of iWork installed on my iMac and Macbook Air. For those situations where I need the full-featured linked text boxes, I fire up Pages '09 and can whip out a printable document with ease. Writing to text would be nice. Linked text boxes are back! This is absolutely incredible news. I love iWork and have used Pages, Numbers, and Keynote since their inception, but the one very important feature that has always been lacking for me has been vertical text input in Japanese (and other languages). Text Edit has always been able to do vertical text input, so it has mystified me why Apple couldn't integrate it into Pages. I wonder where MacRumors found out that they would be adding vertical text input? It's not written in the press release... And it'd be weird if only iWork for iOS got this feature as this article seems to imply. I'll need it on Mac too.